Population structure and inbreeding can confound results from a standard genome-wide association test. Accounting for the random effect of relatedness can lead to lower false discovery rates and identify the causative markers without over-correcting and dampening the true signal. This presentation will review four different methods of analyzing genotype data while accounting for random effects of relatedness. 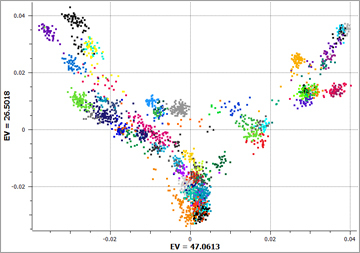 Methods include PCA analysis with Linear Regression, GBLUP, EMMAX, and MLMM. Comparisons will be made using data from the Sheep HapMap project and a simulated phenotype. After presenting the various methods, we will discuss how these results can be obtained using Golden Helix SNP & Variation Suite (SVS) software and how SVS can be used to compare and contrast the results. Greta Linse Peterson is Golden Helix's Director of Services. Her main duty is managing the Field Application Scientist and Customer Support teams. Greta and her team are also responsible for software quality control, ensuring that the software releases are subject to the most rigorous testing protocols and for all the technical documentation and tutorials. Greta joined Golden Helix in 2008 when she completed her Masters degree in both Mathematics and Statistics at Montana State University in Bozeman. When Greta is not working, she enjoys spending time with her family and hiking the surrounding areas of Bozeman.